Home › Let Me Throw You A Party! There is nothing like a good Facebook Party to energize your community and get them involved with your work. I have experience hosting Facebook Parties for cozy mystery authors and would love to help you with your next event. I’ll write a script for your party, create an eye catching event invite, and run the show on party day. Due to the preparation needed for these events, parties need to be booked at least one month before your scheduled party date. Marie is the “Facebook party hostess with the most-esss!” She made my launch prep and party stress-free so I was able to relax and enjoy the time with my guests. 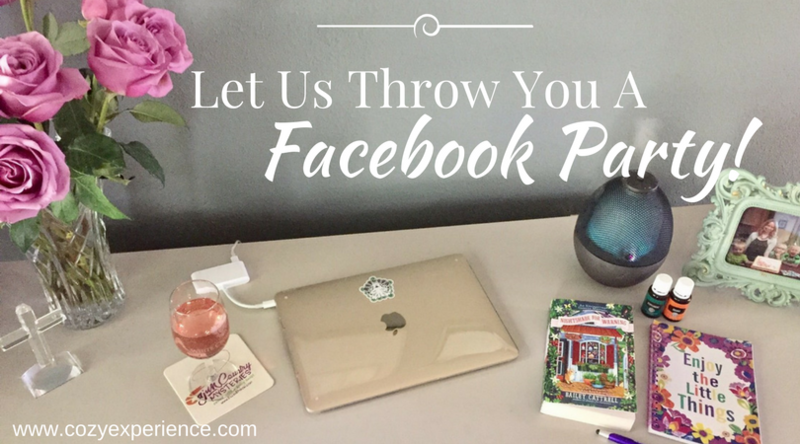 I highly recommend Marie and A Cozy Experience to help make your author Facebook party a big success! As a debut author, I knew I’d wanted to do a Facebook Launch party didn’t have the slightest clue how to get started. Marie made the process painless from creating custom graphics to promoting the party to collaborating with me on questions. I’d definitely use her again! Want to see an example of a past party? Check one out here. A complete list of my Upcoming Party Schedule can be found here. Email Me to Reserve Your Date!